BHP Billiton is one of the world’s top producers of major commodities including iron ore, metallurgical coal, copper and uranium with over 65,000 employees and contractors with a market capitalisation approaching AU$100B. Headquartered in Melbourne the business has an uncommon dual listed structure with an Australian ASX listed ‘Ltd’ entity and also a British based ‘Plc’, whilst a unified board runs both entities. Developing the content for both meetings is a major undertaking for any business, but especially so in this unique case of separate companies with messaging tuned between the two audiences. 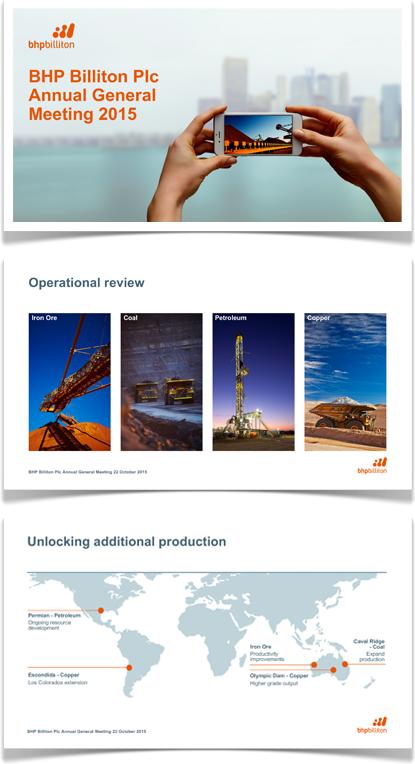 BHP Billiton approached iReport to leverage our unique track record in AGM presentations. Since founding in 1997 we have overseen the design and delivery of over 100 AGM presentations. BHP Billiton wanted to achieve a high end and, professional level of design and delivery, as outside consultants with many years experience we were asked to bring our broad experience to the on-screen material. A highly successful presentation resulted from the process as seen in the archived slides here. Between the time of the London and Melbourne AGM, the tragic Sammarco disaster occurred requiring significant change of focus, yet also retention of the key messages that remained important prior to the disaster. Working closely with the BHP Billiton team, it was another successful event for the Australian AGM staged in Perth. When we are invited into your event, we consider ourselves as part of your team. Our approach is the same for a large company like BHPB as it is a for newly listed startup. 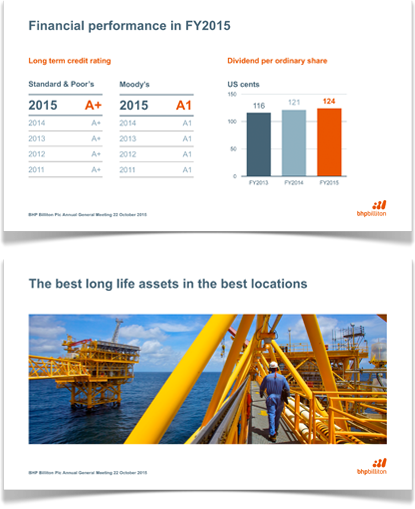 Our philosophy is also the same whether our involvement is a standalone presentation design such as this example with BHP Billiton, or if it is a more integrated service where we stage, direct and produce the entire Annual General Meeting. Our success is indivisible from yours. We bring all of our experience, creativity and passion to bear you for you and for your audience and stakeholders.